Servitob: Can my Razorback ram your Razorwing fighter? ZombiePirate: It’s an aeroplane, but it’s got a base so technically the rules say it can be rammed. Servitob: OK, my ground based tank is going to ram your flying aeroplane. Yesterday afternoon I had a couple of games against the youngest member of our gaming group. He has been using his Chaos Marine army and has learnt fast. We had two 1500 point games, the first against my Tyranids, the second against my Eldar. The Tyranid game was quick and bruttle, the Chaos Marine army being tabled in turn 4 and most of the Tyranids were still around. His choice of Kharn the Betrayer proved entertaining in both games. In the Tyranid game Kharn and his faithful Berserkers munched through a 17 strong Termagant unit before half of the Tyranid army (including the Doom of Malan’tai – more about him in another post) shot the snot out of the unit. Kharn being on his last wound was assault by yet more Termangants and had some fun killing lots of them before he was taken out. 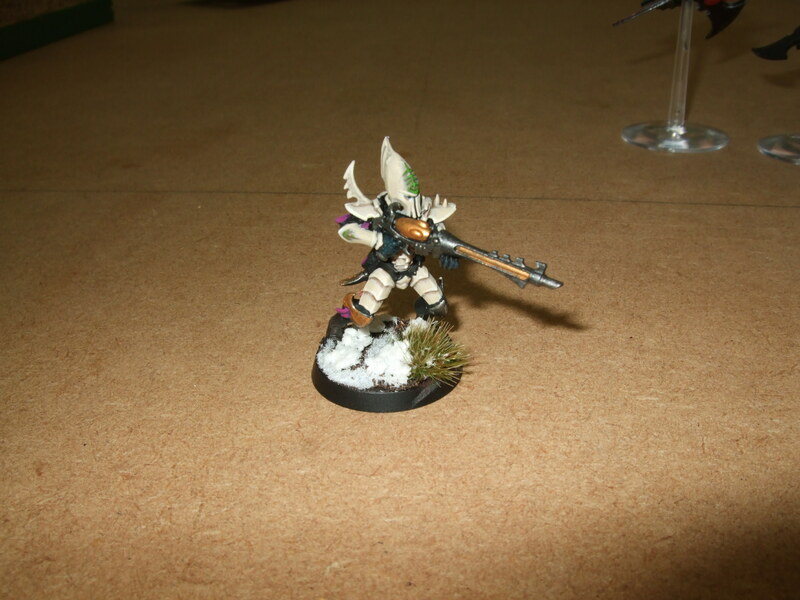 The next part of my post though is listed in the title – How to loose with Eldar. So here’s the lesson. Roll dice badly. How I can fail so many 3+ saves I will never know. Have your opponent pass 9 out of 10 3+ saves repeatedly. Most of his marines were Plague Marines with their Feel No Pain ability, but they hardly used it as he kept passing 3+ saves. The only ones I was able to kill were those hit by Fusion Guns and Wraithcannons. Have both your Wave Serpent and Falcon one shooted and explode in turn 3. Get your Wraithguard into close combat (really bad move on my part). Moving your Striking Scorpions out of cover in the woods to get battle cannoned by a Defiler. Only the poor Exarch lived. Let the Daemon Prince assault your Dark Reapers in turn 2. The Scorpion Exarch. Despite loosing his entire unit to bad leadership, he still managed to take down the Daemon Price in close combat, a Rhino and in the last turn head shoted Kharn himself! So at least one thing went well. On the serious, non-moaning side I’ve been learning very quickly how to use my Eldar, mainly due to bad choices in both army construction and battle tactics and I hope not to repeat these mistakes. Besides making the longest post title in the history of ever; I thought I’d upload some pictures of some of the latest miniatures as painted by the crew for last week’s mega gribble. 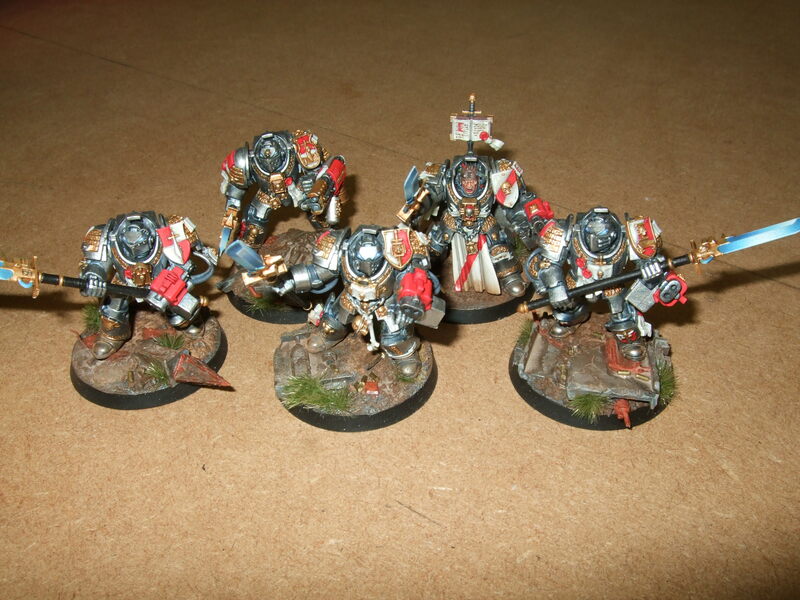 First up are some Grey Knights, as painted by Carabus. I especially like the basing here. 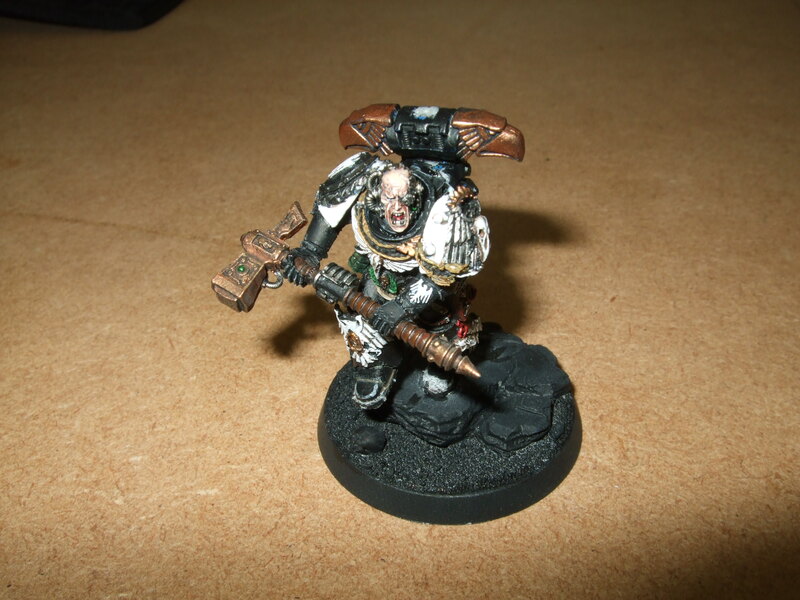 Space Marine Shadow Captain Korvydae of The Raven Guard WIP, as painted by our guest gamer. 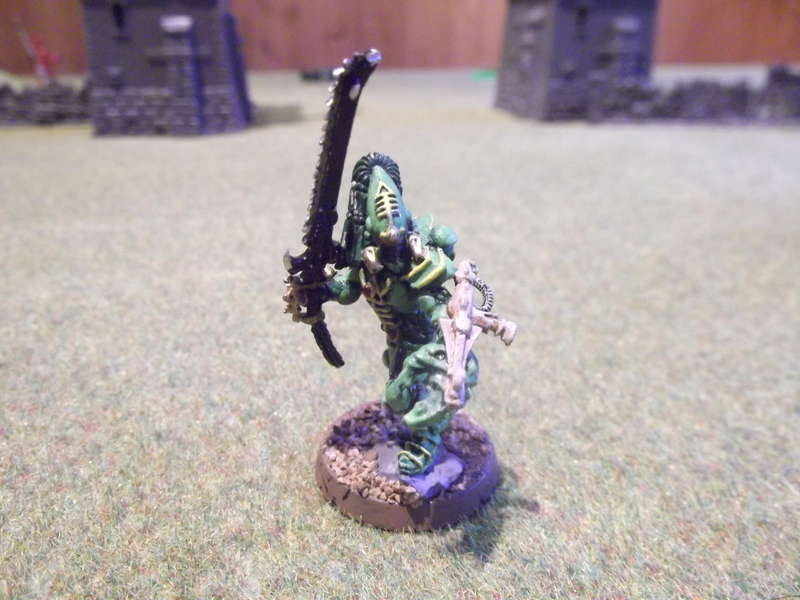 Dark Eldar Kabalite Warrior WIP by ZombiePirate. Click on the pictures for higher resolutions! In the afternoon light the ancient Eldar Autarch Cleddyf, leader of the Eldar Warhost Colledig, glimps a sight of their foe; the Orks! Though to be fair the Eldar had known of the greenskins presence for sometime, you really can’t hide the smell of hundreds of sweaty Orks that all have a severe soap allergy. The stench was so overpowering that Cleddyf considered laying down his shuriken pistol and grabbing some shower gel. His scouts even informed him that most of these Orks were so dirty that you couldn’t even see any green on them, though there may have been other reasons for this. This is my own telling if my match with ZombiePirateXXX, and i hope to keep with the Eldar theme. I deployed my Eldar mostly on my left and in the centre, close to two of the five objectives that were on the table, and within potential striking distance of a third. I felt a little un-nerved by being so heavily out numbered (remember that I have been playing 40k for 16yrs and have been using Tyranids the whole time – I only got the Eldar about a year ago – so being outnumbered is still an unusual experience for me). TURNS 1&2: Well things didn’t start to well. Most of my ranged weaponry was out of range and the firm prism missed. 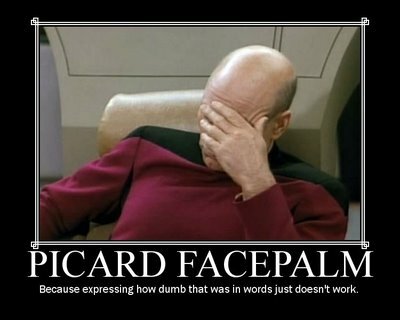 In total I must have killed about 2 Orks in my first shooting phase. Cleddyf looked at the information displays inside the Wave Serpent and a feeling almost akin to despair came over him. More practice at the firing ranges Eldar! The Orks proceeded to spend the first two turns ripping into the Eldar. The poor guardians didn’t stand a chance as out of the skies came a mob of Orks attached to ACME rockets. One even had a slight coyote look to him. In the centre the guardians that had moved forward to an objective had killed most of the foul greenskins that faced them, but alas it was not enough. The Farseer had obviously not seen it coming as himself and the guardians that were with him were quickly overcome by BO and died gasping for breath. The Dire Avenegers and D-cannons fared little better as they were outshot by Orks! How embarrassing thought Cleddyf, out-shot by a bunch of near-sighted savages. Turtle! Unless your Tyranids don’t move towards an Ork army. Don’t worry about numbers; with the right unit you literally CAN kill them all. Get a second close combat unit – whilst the Scorpions were away from the bulk of my army I had nothing to oppose the Ork advance. Fire Dragons are great at a barbeque. And finally – Scorpions Rock!!!! As promised here is the battle report from our pilgrimage to geek central. Gribblin took his Eldar (apparently it’s easier to travel with a load of vanity obsessed lady-boys who like matching accessories than a horde of evil alien beasties who want to mate with your face) and I took along my, far more manly and personal hygiene averse, Orks. Warboss Tuffgit – “Right ‘den ladz. I’z da Warboss and mah sneeky gitz has scouted around and found some tasty looking loot around ‘ere. OI! Come back ‘ere Scrogg, that loot isn’t goin’ anywhere yet and you bes’ keep yer hands off the good stuff before I bash yer stinkin’ ‘ed in. 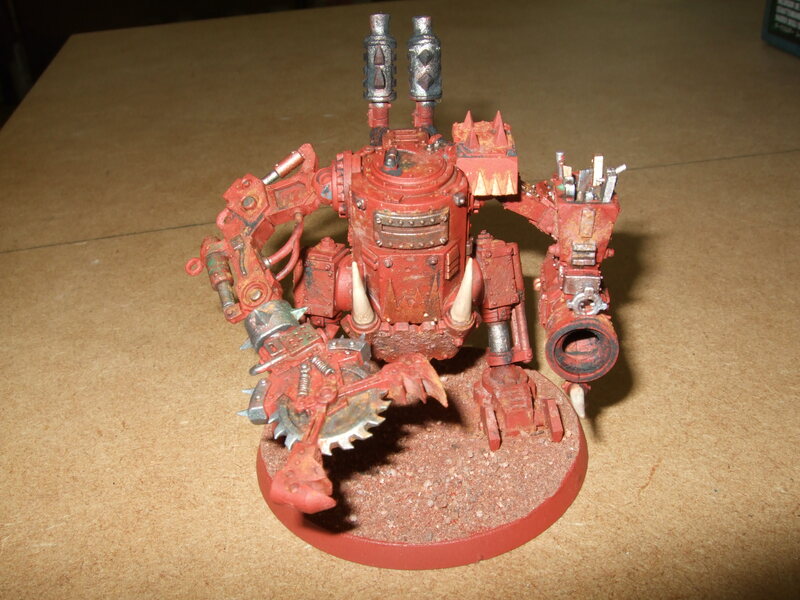 “Where’s my zoggin’ Trukk, winch those Mega-nobz in there gud. I want to be krumpin stuff first!. First turn – Most of my army charged forwards. We were playing for 5 objectives that had been placed all over the map, I do have some piccies that might make more sense for the layout. Pretty much everything was ruins and that is where the objectives were placed. The Eldar deployed in the middle and on their left flank, my Ork just filled with whole table edge with the Warboss and his Mega-nobz in a trukk on the left backed up by the Shoota Boyz squad and the Stormboyz. I had my Lootas and SAG Mek in a building in m y deployment zone and another unit of slugga boyz on the right flank and the final 2 units of Slugga Boyz in the middle ready to run up the battlefield. I was pretty happy with my deployment. From now on I’ll just post the thoughts of my Orks on their various turns. I am sure Gribblin can come and give his point of view too. With 5 loot objective round the table I was holding two and the Eldar one. Two Dire Avengers were all that was left of their unit and they were camping their objective. I had my Shoota Boyz squad holed in a wood sitting on their objective. For the first three turns I had blasted and chopped my way through a decent portion of the Eldar army, although the Fire Prism was annoyingly still at full strength. My Warboss had butchered a Falcon and the Stormboyz had seen off a Guardian squad as well as the Fire Dragons that had seen the end of the Mega-nobz. The Wave Serpent that had got to my deployment zone was falcon punched by a nob with a power klaw causing its precious cargo of Scorpions and attendant Autarch to punch out. This turned out to have been a bad move on my part. The Scorpions went into the Lootas with expected results. My Big Mek tried to shoot them and for the third game in a row rolled a double 1 and vaporised himself. A full mob of 20 Orks went into the Scorpions and took some casualties, they fought back only to see Gribblin only fail a single armour save! The sweeping advance hacked the rest of the unit apart. 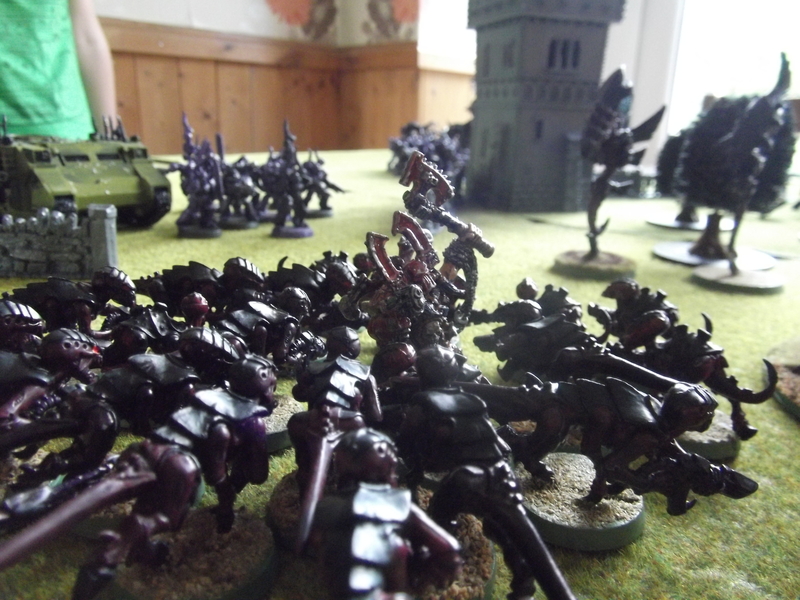 The following turn the Scorpions went into another unit of boyz, again hacking them to pieces and running them down. This left my depleted boyz mob who held the centre objective facing the almost full strength Scorpions. They’d already seen two units of 20 get wiped out. In went the Scorpions, slaughtered all but a couple of boyz and the Nob, who did a couple of wounds back but were still soundly beaten. This left us with one objective a piece. The Warboss wandered over and did a fantastic job of showing why I shouldn’t even bother buying him ‘eavy armour as the scorpions shot at him before assault and took two wounds off him as I couldn’t pass the 4+ saves…. He was then finished off by the Autarch in assault. Not one of Tuffgit’s most glorious moments. All that I had left on the table was my Shoota Boyz and the Trukk the Mega-nobz had been rolling in that had had its Big Shoota blown off. So, in true Ork fashion I conga-lined the shoota boyz so that the sat on two objectives. It boiled down to the last turn of the Autarch against the Boyz. I shot the unit, they took casualties, leadership test was taken, they legged it. Rallied in the final turn but were out of range for assaulting so the Orks won 2-1. I have to say that this was one of the most fun games I have had. For the first few turns the Eldar got hammered by the Orks but then the Scorpions single-handedly seemed to be winning them the game for the last few turns as they carved through Boyz mobs like they weren’t even there. Although, there was some decent rolling for armour saves on Gribblin’s part. However, that just added some nice tension to the game. By turn 6 we both had virtually nothing left and we were heading for a draw as Gribblin was heading to contest one of my objectives to tie the game 1-1. Luck was on my side though but this was a very close and bloody game. Once my home internet is fixed I will probably update with a couple of photos that I took.